Find the Great Sigil Stone and close the Great Gate before a Daedric siege engine invades Tamriel! A statue of you as "Savior of Bruma"
You have 15 minutes to complete this quest. Enter the Great Gate and make your way to the World Breaker (the main tower). Ascend the World Breaker tower to the Sigillum Sanguis. Take the Great Sigil Stone to close the gate. As soon as you step through the Great Gate, you will be given 15 minutes (real time) to complete this quest. Any longer and the indestructible Daedric Siege Engine will make it to Tamriel, resulting in Martin's death and the invasion of all Tamriel by Daedra. At that point, the game is over: you must reload an earlier save game. This quest can also be terminated if Martin dies while you are in the Great Gate Oblivion World (although the combat in Tamriel actually pauses while you are in there, so Martin can only die if he receives a fatal blow just as you step into the Gate). You do not need to worry about losing track of time: every minute, the game will post a reminder on the screen telling you how many minutes you have left. However, this countdown clock is actually one minute off: the first message you see tells you that you have 13 minutes left, when in fact you have 14 minutes left. This countdown will continue until it tells you that you have 2 minutes left (at which point you really have 3 minutes left); 65 seconds later, the countdown starts to update every 5 seconds (starting with one telling you that you have 115 seconds left). Fifteen minutes is a relatively short time to get through this world, but not so short that you need to panic. A normal run should take 10 to 12 minutes. Even if you get lost on the way to the main tower, as long as you make it to the bottom of the tower with two minutes to spare, you should still be able to finish the quest as long as you can avoid stopping to fight anyone. Casting Invisibility so that you do not have to fight enemies. More specific strategies are listed throughout the guide. 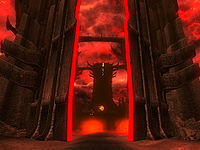 When you first step through the Great Gate, you will see a huge war gate in front of you that is just starting to open. On the far side of the war gate is the ominous Siege Crawler, which over the next 15 minutes will slowly walk forward towards the great gate. The Siege Crawler does not pose any immediate threat to you, but will periodically shoot a volley of Fire spells at you, which can be deadly. 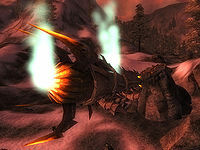 The many fire towers in the area and the couple of Daedra accompanying the Siege Crawler can also be lethal. The World Breaker (the main tower) is directly in front of you on the far side of the Siege Crawler. Between you and the main tower are six peripheral towers, the World Breaker Guards: a line of three on your left, and a line of three on your right. The nearest four World Breaker Guards will take you to the main island. 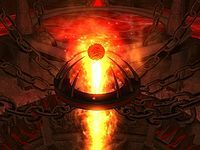 The furthest two World Breaker Guards each contain a switch on their top level that opens the final sets of war gates. Therefore, you will need to ascend one of those towers in order to gain access to the main World Breaker tower, unless your Acrobatics is high enough to jump around the gates. 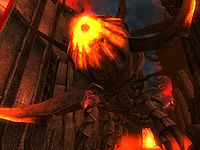 The one other feature of interest in this world is a cave system, The Smoke and Scorch, which leads you to the bottom levels of the final two World Breaker Guards. The exterior of this world is barren; there are the usual Oblivion plants and a few Dremora. The most direct way to get to the main tower is to ignore the first four World Breaker Guards. Instead, run towards the Siege Crawler, following the left-hand (western) lava shore. It is possible to run along this shore without stepping in the lava, although you will be under constant attack from the numerous fire towers in this area; if you can survive some lava damage, you may also choose to just swim through, run over, or jump across the lava. Once you pass the middle pair of World Breaker Guard towers (probably shortly after you reach the Siege Crawler), jog to the west to get under the bridge. Continue north and you should run straight into the door to the cave system. This can be done in less than a minute. Fight your way through the caves into either one of the two final World Breaker Guard towers. Ascend the tower and activate the Gate Control. Enter one of the first two World Breaker Guard towers. This allows you to keep well clear of the lava and avoid a few fire towers. On the downside, you will have to fight or evade a couple of creatures in each tower, and waste some time running up and down and riding Corpse Mashers. Each tower has two doors leading to high-level narrow bridges that connect to the second set of World Breaker Guard towers. Descend in that tower to the lower level door, which lets you out onto one of the wide bridges continuing northwards. Alternatively, if you have high health or Acrobatics, after entering the second tower, take the door on the same level as the one you entered through to get to the bridge that joins the middle two towers and jump off. This method is quicker, but comes at the expense of health. Your next problem is that these bridges have collapsed - on both sides. You can try to jump across the broken spans, or jump down and make it across the broken terrain underneath. It is possible to make your way on the surface to the exterior doors to each of the final two World Breaker Guard towers. If you can jump the broken spans of bridges, you are on a path that leads right to the towers. Otherwise, you need to work your away around the many rocks and cliffs on the surface to reach the entrance. By taking the surface route, you avoid a couple of creatures and avoid a slow ride up the Corpse Masher. On the other hand, you can waste a lot of time finding your way through the rocks, and you also miss some of the little loot available in this world. The World Breaker tower is a fairly standard Oblivion tower, with a Sigillum Sanguis at the top where you will find the Great Sigil Stone. In the lower level there is just one Dremora, the Sigil Keeper. If your lockpicking skills are poor, you will probably want to stop and kill him, because he possesses the Sigil Key that opens the Sigillum Sanguis. If you miss him, there is a second Sigil Keeper at the top of the tower. From the ground floor, you will enter the Vaults of End Times. Ascend the first corridor, watching out for the three guillotine traps. The corridor leads to a room with three possible exits. The way upwards is through the door on your left (on the south side of the room); the right door leads to a punished loot container guarded by an Atronach. Continue upwards in the main tower to the Sigillum Sanguis. In the Sigillum Sanguis, you probably want to stop and find two of the Punished, which contain treasure. Then grab the Great Sigil Stone. Like other quest-related Sigil towers, Sigil stones can be taken multiple times. However, this tower will only donate Great Sigil Stones, and Martin will only take one, so don't go overboard here or you will be left with useless items in your inventory. You will arrive back on the battle field underneath the Siege Crawler, which will immediately collapse around you when the Great Gate closes. No matter how quickly you complete the quest, the Siege Crawler will always have emerged partway through the gate. On the ground you will find a standard Sigil Stone, leveled as usual, that drops from the Siege Crawler when it shuts down. Sometimes you have to activate the siege machine to release the Sigil Stone. Help clean up any remaining Daedra or Dremora. Martin is once again essential, so do not worry about keeping him alive. If there are any other survivors of the battle, they will start clapping. Talk to Martin, who will take the Great Sigil Stone from you and tell you to meet him at Cloud Ruler Temple when you are ready for the next quest... ready to enter Mankar Camoran's Paradise. When you return to Bruma from Cloud Ruler Temple, you will find a statue of you as the Savior of Bruma, located to your right when entering the city from the North Gate. The statue's appearance is determined (and it spawns) the moment you enter a "new" cell occupied by Martin. This will usually be when you open the door to Cloud Ruler Temple after he has returned there, but can also be on the road to it if you intercept him along the way. The armor and weapon will be the best quality items that you had in your inventory at the time, not necessarily the items that you had equipped. The game determines the "best" items - not just the most expensive items - taking into account enchantments; for example, the Dark Brotherhood Black Hand Robe has zero value but will take precedence over many other items, including some magical armor. The game calculates the value of items through its Gold Septims value, armor protection, and the amount of enchantments, in that order the latter being the "best". If you are very particular about the appearance of your statue, it is recommended that you leave all of your additional items in a safe place before talking to Martin. If you possess a quest item that cannot be removed that you do not wish your statue to wear, it is still possible to work around this; see the Notes below. If you are in possession of certain quest items, you will be unable to remove them from your inventory and your statue will end up equipping them. The Bloodworm Helm and Umbra in particular can be obtained permanently (tagged as a quest item), and because of the grade of the enchantments, will always be forcibly equipped on the statue. To boot, these items either cannot or should not be removed (Helm irremovable via a clone-dupe bug, Umbra's benefit is 0 weight from never turning it in). To get around this, either enchant a ring or create a spell that will disintegrate armor or weapon "on self". Wearing only the quest item in question, repeatedly equip the ring/cast the spell until the item is broken. Since the statue is quasi-living, it shares the same AI as NPCs, and therefore will not equip a broken item. This is because the statue script uses the createfullactorcopy command to generate a duplicate of your character, in a similar matter to the method used to create your doppelgänger in Symbols of Office. In the case of the Bloodworm Helm, it is still possible to have your statue wear no helmet at all. Even if the Helm is broken in your inventory, the statue will not wear it and its face will be fully visible. On the PC, quest items can be removed via console commands, and replaced once the statue is made. It is best to be careful when doing this. If the game determines that your "best" weapon is a bow, the bow will be on the right hand of the statue, where as in gameplay the bow is held on the left hand. If arrows are equipped when you open the door to Cloud Ruler Temple, they will appear on the statue on its back. After the statue has been created, Bruma residents will occasionally greet you by saying "Hey, you look just like your statue! What can I do for you?". This is the only time in the game when you can see and watch an Oblivion Gate open, as all other gates are pre-opened. If you leave the Sigil Stone that appears after you exit the gate on the ground and choose not to pick it up, it will continue to level up as you do. In other words, if you do the quest at level 6 but don't pick it up until level 17, you will get a Transcendent Stone instead of a Subjacent at level 6. Like other Sigil Stones its effects will not be determined until you pick it up. This stone is prone to disappearing randomly on reloading, however. It is recommended that you create a permanent save just before activating the Great Sigil Stone, then save and reload repeatedly to ensure the reward stone won't disappear in future saves. An achievement will be unlocked upon closing the Great Gate. The scene with the Siege Crawler is one of the Emperor's visions, seen when starting a new game. When you take the Great Sigil Stone, the Great Gate may not close when you return to Tamriel, even after the Siege Crawler has emerged from the gate. ? If this happens, reenter the Great Gate and run back through the world once more to the Sigilum Sanguis. At that point you should be transported back to Bruma, with the gate gone. When you take the Great Sigil Stone, you may not be transported back to Bruma. ? If this occurs and a save game does not seem to rectify the problem, make your way back to the gate and manually leave Oblivion. The main quest will continue as normal. The statue may not hold a staff correctly if it was the best weapon in your inventory at the time the statue was created. 10 The Great Gate has opened! I must enter it at once and get its Great Sigil Stone, before the Bruma defenders are overwhelmed. 20 I have entered the Great Gate. The Daedric Siege Engine is crawling towards the portal! If it exits the Gate before I reach the Sigil Stone, all is lost. 30 The Daedric Siege Engine has almost exited the Gate! I must reach the Sigil Stone! 40 The Daedric Siege Engine has exited the Great Gate! 50 I reached the Great Sigil Stone and closed the Gate. The Battle of Bruma is won! Now to give the sigil stone to Martin. 60 Martin was pleased to see me return alive from the Great Gate. I gave him the Great Sigil Stone, and he has gone to Cloud Ruler Temple to prepare for the portal-opening ritual. It is possible to use the console to advance through the quest by entering setstage MQ14 stage, where stage is the number of the stage you wish to complete. It is not possible to un-complete (i.e. go back) quest stages. See SetStage for more information. This page was last modified on 3 April 2019, at 05:24.